Here at State In The Real, we would like to take a moment, during this busy thanksgiving holiday, to appreciate all of the songs that each of us is thankful for. 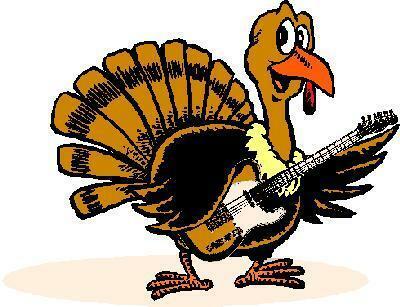 Take a moment to read about which songs we chose and why we are thankful for them. Then, have a listen to the playlist. Eric Dowling – For this year, I am thankful for “Wonderful Everyday” by chance the rapper. I am thankful for it because it brings a sense of nostalgia to a genre that is conceived of being about drugs and women, and this song celebrates the greatness of life. Ben Rappaport – For this year (and every year), I’m thankful for “Runaway” by Kanye West. I am thankful for it because everyone needs a time to reflect on themselves and listening to “Runaway” allows you to look deep within yourself and be consumed by a ballad that connects your emotions to your actions. Also pianos in rap songs are dope. Olivia Price – I’m thankful for “Fake Empire” by the National because it challenges listeners to view our generation from a third party perspective. It sheds light on how we distract ourselves with artificial, superfluous things to avoid thinking about the bigger issues. It was really eye-opening for me the first time I heard it, and it still reminds me to value the finer things in life. Cris Gutierrez – For this year, I am thankful for “Take Me To Church” by Hozier. With music becoming more and more superficial, Hozier is one of the few remaining bright spots. He embodies what music is all about and he’s an artist full of passion. To put it simply, “Take Me To Church” is a work of art, the song is all about a perfect moment with someone you love, but not being able to truly express yourself with the influence of society’s judgment. This break, just be yourself and stand up for what’s right. Stephanie Davis – I’m thankful for “Out Getting Ribs” by King Krule. Though it seems simple at first listen, the song has a hauntingly beautiful guitar tune and bittersweet lyrics about desire and longing. King Krule (aka Archy Marshall)’s creative genius at the young age of 20 & his unique combination of punk rock, jazz, and even some elements of hip-hop makes him, in my opinion, one of the most exciting artists in music right now. Henry Ulysses Englert – I am thankful for “Clique” by Kanye West, ft. Big Sean and Jay-Z. This song is about true friendship, a thing Ye, Jay, b.i.g, and I value more than anything. But when I am not with them doing donuts in Ye’s orange Lambo Mercièlago, I also enjoy spending time with my poorer, more homely friends in the city. They are the real MVPs, as genuine, non-hating, dope azz, 03′ Honda Accord-owning people are hard to find in this crazy post-industrial world. My crew deeper than Wu Tang. Jonathan Lui – Seahaven’s “On The Floor” is a song that I will always be thankful for. The whole composition of the song lends itself to a hauntingly sad atmosphere. While the subject matter may not be ground breaking, the band manages to uniquely describe the process of dealing with an unhealthy relationship/past through their lyrics. If you love yourself go listen to more Seahaven. Tariq Rashid – I’m thankful for “Hold On, We’re Going Home” by Drake feat. Majid Jordan. This heartfelt Drizzy ballad has become a standard when I want to get in my feels. Everyone’s dealt with tender tale of seeing the potential in someone who people disregard as bad for you. You look past the criticism and through to love. I’m sniffling as a write this. Thank you Drake. I want this played at my wedding. Emily Foster – LCD Soundsystem’s “All of my Friends” is a song I am always thankful for. The song accuratey represents what it’s like to be at this weird transitional stage in life. I can listen to it no matter if I’m happy, sad, confused and it still somehow explains what I’m feeling. Aizya McGee – I’m thankful for “Clouds” by One Direction, and their whole album really. It never fails to put me in a good mood, and sometimes I like upbeat pop music to be playing in the background of everything I do (homework, driving, procrastinating). Plus, their first album came out my freshman year, so it’s like they’ve grown with me these past three/four years. Or something. Collin Edgar-Smith – I’m thankful for “They Want My Soul” by Spoon. The title track from their latest album, this song takes a jab at shallow people living hollow lives. Britt Daniel provides a much needed check for a music scene overpopulated by soulless, educated folk singers. Leya Ramer – As I look forward to the next month and my impending graduation in December, I am thankful for the song “Drinking Class” by Lee Brice. This song reminds me of my roots and how hard my family has worked to allow me to get where I am today. Not to mention the drum piece in this song is killer. State In The Real's Staff Weighs In On Nicole Westbrook's "It's Thanksgiving"